As scientists, an essential skill to have is accurately naming molecules to convey the correct information. The International Union of Pure and Applied Chemistry (IUPAC) have developed a naming system for molecules which is also used in VCE chemistry. A representation of a molecule that provides information about the presence of specific atoms and how many atoms there are in the molecule. It does not give any representation of the structure of the molecule. Similar to the molecular formula as it states how many of each atom are present in the molecule however, each group of atoms are placed sequentially one after another to represent their positions in the actual molecule. Quite literally, a drawing to represent the molecule. Bonds are drawn in between atoms. The base of the molecule name will indicate what kind of hydrocarbon backbone the molecule is based on. When naming alkenes, a number should be added to indicate the location of the carbon-to-carbon double bond. 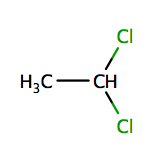 This number can occur either before or within the molecule name, such that both 2-butene and but-2-ene are acceptable. 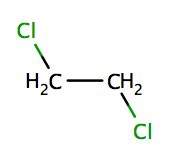 See Functional groups for naming of specific functional groups. When numbering functional groups, make sure to count the least number of carbons possible. Because of this the following molecules are both called 3-heptanol, rather than 3-heptanol and 5-heptanol.